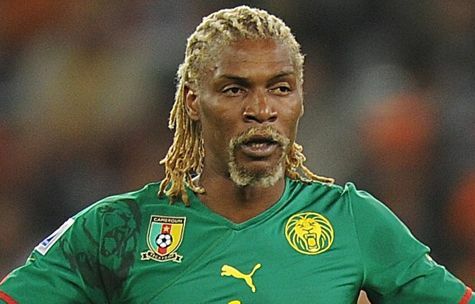 Ex-Liverpool and West Ham defender Rigobert Song is reportedly fighting for his life after suffering a stroke. The former Cameroon defender was rushed to hospital in Yaounde on Sunday after collapsing at his home in the Odza neighbourhood. Song (40) spent a couple of years at Liverpool before moving to West Ham where he spent one full season before moving to Germany in 2002. The defender made 137 appearances for his country and the football world was quick to unite in support of the Cameroonian with former team-mates Samuel Eto’o and Jamie Carragher sending their best wishes. Song, the ex-captain of Cameroon’s national side, was still in a coma yesterday. Cameroon’s state radio reported that Song, who also played for West Ham United, Metz and Lens in France and Galatasaray in Turkey, was rushed to a nearby hospital from his Yaounde home on Sunday after suffering a cerebral aneurysm. Song was in a coma, the radio reported. Former teammates and well wishers have taken to social media to express their shock as the 40-year-old battles to recover. “I wish you lots of courage and a speedy recovery,” former Cameroon teammate Eto’o said in a Facebook post. Song was one of Gerard Houllier’s first signings as Liverpool manager in 1999, having started his professional career at French side Metz. Song, capped 137 times, played in four World Cup finals and a record eight African Cup Nations as well as winning Olympic gold in 2000. His most startling achievement was playing in four World Cups for his country over a 16 year period, first called for USA ‘94 before representing Cameroon in France ’98, Japan/South Korea 2002 and — most extraordinarily — in South Africa 2010. Song, who is the uncle of former Arsenal and Barcelona midfielder Alex Song, is the manager of the Chad national team. Those who played alongside Song have expressed their dismay upon hearing the news about the charismatic African. Liverpool’s Official Twitter site offered its support, alongside numerous ex-players. “Hope everything ends up okay,” wrote Jamie Carragher, who played in the same Liverpool side. Another team mate Robbie Fowler added: “Thoughts with Rigobert Song and family . . . hope he pulls through.” — Metro.